The next update of videogame Angry Birds Space is called "Beak Impact." Image released June 5, 2014. Angry Birds and NASA have teamed up for the second time to develop a new version of the popular game. The new iteration of the Angry Birds franchise sends players to the space agency's next cosmic target — asteroids. In 2012, game developer Rovio Entertainment collaborated with NASA to create and release the mobile app Angry Birds Space, which allowed them to teach people about physics and space exploration through a highly successful and addictive puzzle game. The new edition, called "Beak Impact," was released earlier this month for iOS and Android devices. Rovio's "Beak Impact" game highlights the NASA's Orion, Dawn, OSIRIS-REx and Deep Impact Missions. It represents the next installment of Angry Birds Space. Image released June 5, 2014. NASA is currently planning a manned mission to Mars, which is slated to launch by the mid-2030s. To pave the way for this ambitious goal, the space agency is looking to use a robotic spacecraft to capture a relatively small asteroid or a piece of a larger space rock and place it into orbit around the moon. This undertaking would allow astronauts to visit and explore the captured asteroid by 2025, and the skills and technology necessary to get astronauts to and from the asteroid will help inform NASA's mission to the Red Planet. (As part of NASA's Asteroid Initiative, the agency is also working to detect, track and characterize potentially hazardous asteroids that could harm Earth). 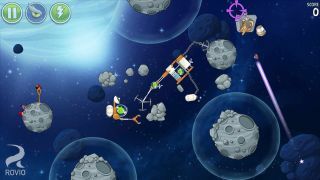 Beak Impact contains 40 new asteroid-based levels for Angry Birds Space that include numerous NASA tie-ins. Hidden within the levels are NASA spacecraft, including the Orion capsule, OSIRIS-REx, Deep Impact and Dawn spacecraft, each of which links players back to NASA information that describes the probes and their related missions. Angry Birds Space mobile app asks game players if they want to learn more about NASA's Orion. Image released June 5, 2014. "It is a great opportunity to educate, inform, and even inspire players about space exploration, all while playing one of the most popular interactive games ever created," Weaver said. In the original Angry Birds Space, players could employ the help of a special character called Mighty Eagle, which allowed them to advance in the game if stuck on a particular level. In the new update, which marks the game's two-year anniversary, Mighty Eagle has now been replaced with Mighty Buzzard — a character based on Apollo 11 astronaut Buzz Aldrin. "With the 45th anniversary of the Apollo 11 mission approaching, we were more than honored to give our own special tribute to legendary astronaut Buzz Aldrin," Marja Konttinen, marketing director for Angry Birds Space, said in a statement. "Our partnership [with NASA] has blended entertainment and education, which has been enjoyed by millions of people worldwide," Konttinen added. "It really has been a fun and unique way of showing just how fascinating NASA's scientific missions are."